NSF Merge software works toward merging multiple NSF files into a single file. The tool integrates advanced algorithms that join IBM Notes Archives without compromising data contents. User centric interface with easy functional features makes the merge NSF files process simple for users. 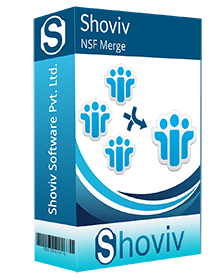 Demo version of NSF Merge software allows you to examine the features and functional steps of the entire merge procedure. The trial version is available free of cost and can be downloaded by clicking the ‘Download’ button. The freeware allows merging 25 emails from each folder of NSF database. Once satisfied, perform limitless NSF merge and join by investing in the full edition of the software by contacting the support team or clicking the ‘Buy Now’ button. 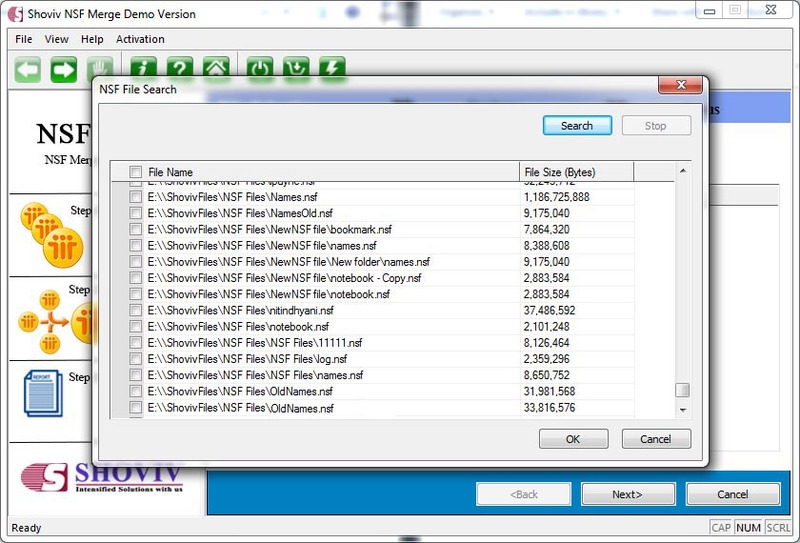 *Free Download allows to convert & save 25 items/folder from NSF Merge. Two or more NSF databases are merged into one common mailbox without affecting the integral components. Merge feature provided in the tool can be used to consolidate multiple IBM Notes NSF files. NSF files from multiple folders can be joined altogether into one new folder. No changes are made to the original structure of NDF database contents while performing the join NSF operation. NSF Merge software incorporates powerful filters that compares different attributes of Notes database items and thereafter removes the replicated items while merging multiple files into a single file. If the actual location of NSF file is unknown, the tool can be instructed to Auto-Search all the NSF files existing on machine. The required files can then be selected for performing merge or join tasks. The NSF Merge tool integrates another important feature that allows you to exclude items from ‘Trash’ folder while performing the merge or join NSF. This can be done by selecting the checkbox associated with ‘Exclude Trash Folder’. 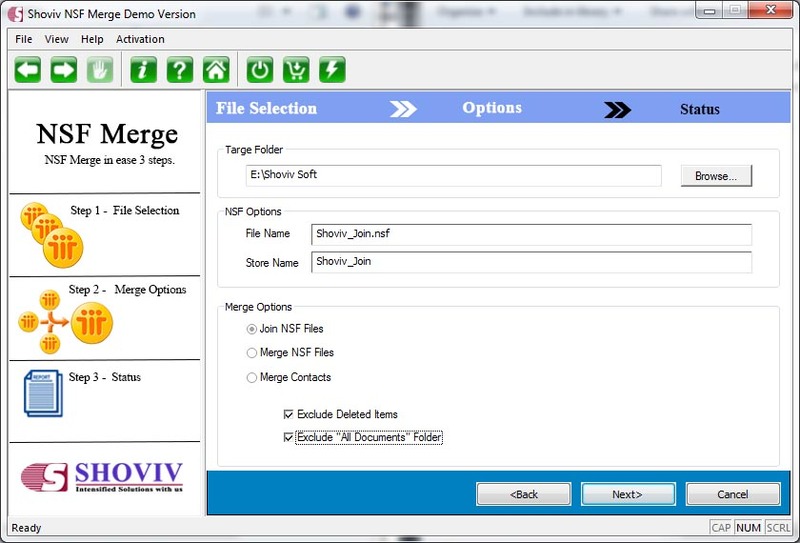 NSF Merge software allows excluding the merging of items from ‘All Documents’ folder. This results in minimizing the actual size of the resultant NSF file and saving storage space on media. Contacts in IBM Notes database are stored in names.nsf file. While merging multiple NSF files, all the names. nsf files from each database are merges into one single file or address book without altering any of the attributes. IBM Notes NSF Merge software does not made any alterations and changes to the meta properties of the database files. Once the merge task is accomplished successfully, the meta properties can be checked to ensure integrity. IBM Notes versions 9.0/ 8.5/ 8.0/ 7 and 6 are supported by NSF Merge software for performing NSF merging and joining tasks. NSF Merge operates smoothly on Windows 10, 8, 7 and all lower versions. Is there any file size limitation imposed on NSF files to perform the merge and join operations? No, there is no limitation or restriction in the process of this awesome tool. You can merge and join any file together without thinking about the size of NSF files. Is there any specific system requirements to perform NSF file merge on the machine? Is it possible to merge emails and contacts from NSF files excluding other items? Yes, it is possible with the Merge NSF Files software. It provides an option to exclude ‘All Documents’ folder and ‘Trash’ folder while merging and joining multiple NSF files together. Is it possible to merge corrupted NSF Files with the help of NSF Merge software? The software doesn’t allow to merge items from corrupted NSF file. In case to merge data from corrupted NSF file, you require to recover data first. Afterwards, you can merge data or NSF file from the healthy state.